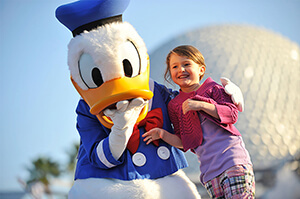 A day at Epcot will really take you places. One minute, you're blasting off on a mission to Mars. The next, you're wandering a marketplace in Morocco. Minutes later, you've filled up your bag with imported treats and Hello Kitty souvenirs at a department store in Japan. All of this traveling will leave you hungry. This post will solve that problem — we've scoped out some frogtastic quick service restaurants at Epcot for famished world (and space) traveling frog families. Hopping around Future World and World Showcase, we've focused on dining spots that will let you experience some of the wide-ranging foods available in the park. The country pavilions of World Showcase allow you to take a culinary journey. At the same time, we know that your tadpoles may not be very worldly when it comes to food and would rather stick to their old standbys. 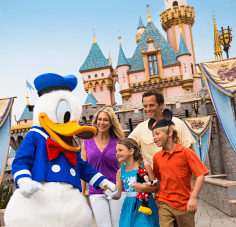 While everyone will have their favorites, we feel that these five quick service restaurants at Epcot will give you the best value for your money and satisfy the tastes of the diners in your party. Dig in! Starting off our culinary trip around the world is Tangierine Café, nestled in Morocco. Take in the beautiful architecture while enjoying a taste of the Mediterranean. 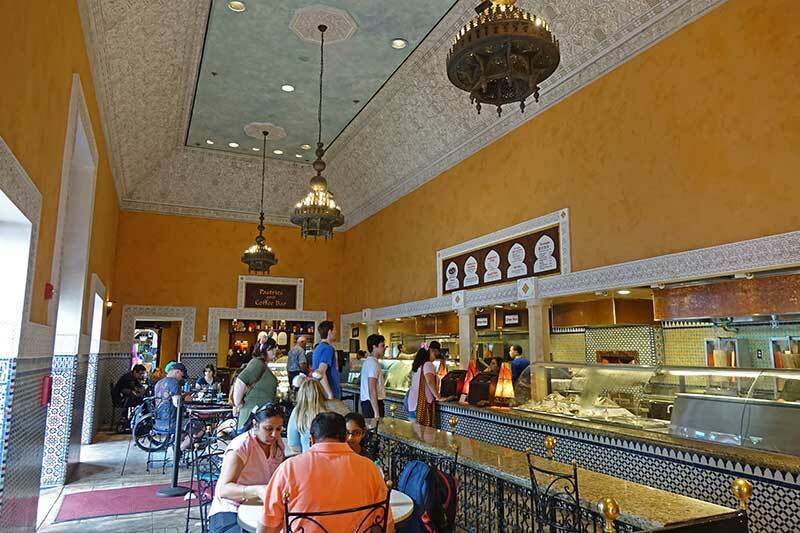 Known for its delicious Shawarma Platters (you can choose from chicken or lamb, served with hummus, tabouleh and couscous), Tangierine Café is a lighter (but still yummy) pick. Tadpoles who may be a little less adventurous can opt for a hamburger or chicken nuggets. Guten tag! 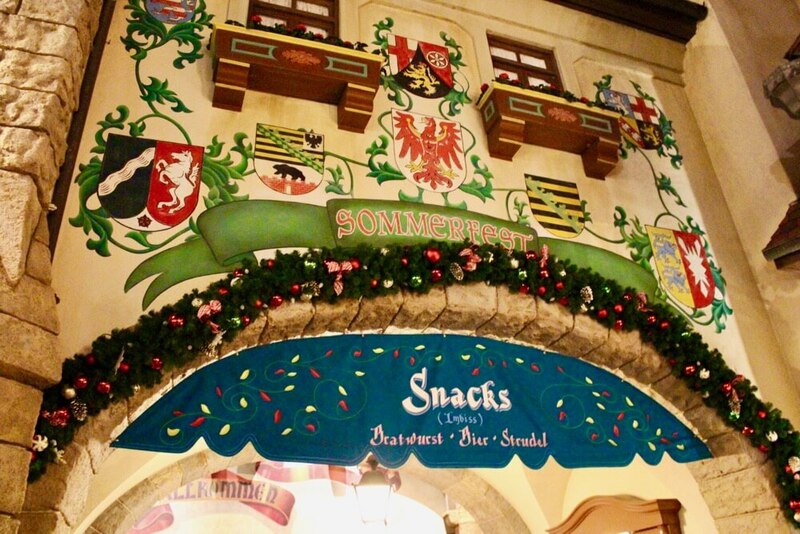 The flavors of Germany await you at one of the most detailed pavilions in Epcot. For a short taste of Germany, hop to Sommerfest. This Epcot quick service stand serves delicious dishes from Deutschland. Bratwurst and frankfurter are the main dishes, with apple strudel and black forest cake as dessert. You can certainly get into the "spirit" of Oktoberfest with beer and wine. 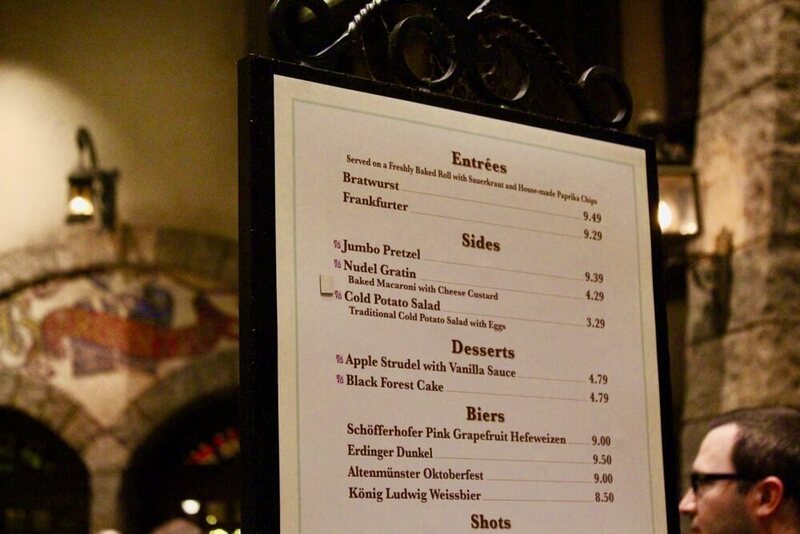 For us, Sommerfest serves our favorite World Showcase snack. The Jumbo Pretzel is enormous, almost twice as big as the Mickey versions found in the parks. It's a delicious snack that can fill you up in-between meals. I would have taken a picture, but it was devoured quickly. One of the things we especially like about this restaurant is the ample seating. Itadakimasu! There comes a time in every vacation for harmony and quiet contemplation. 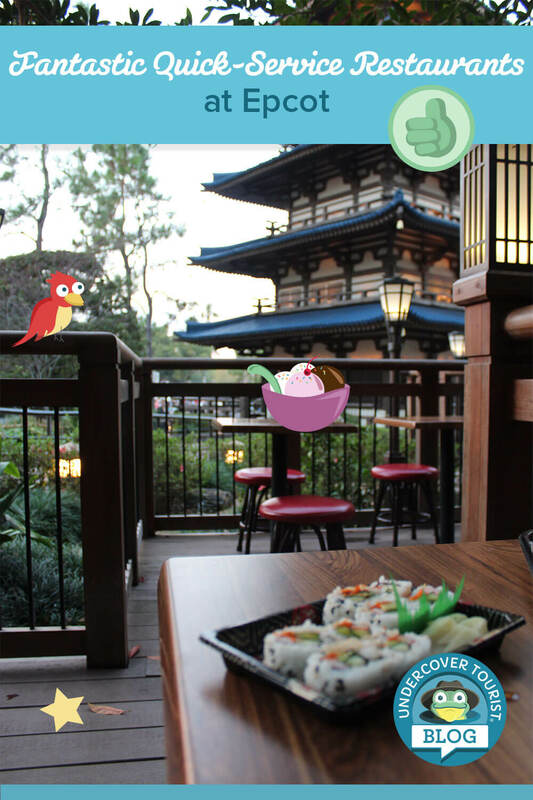 Yes, it's odd to find that in a theme park, but it exists within the Japan pavilion at Epcot. With lush Japanese flora, koi ponds and the torii gate, this pavilion sends you to a relaxing state of mind. 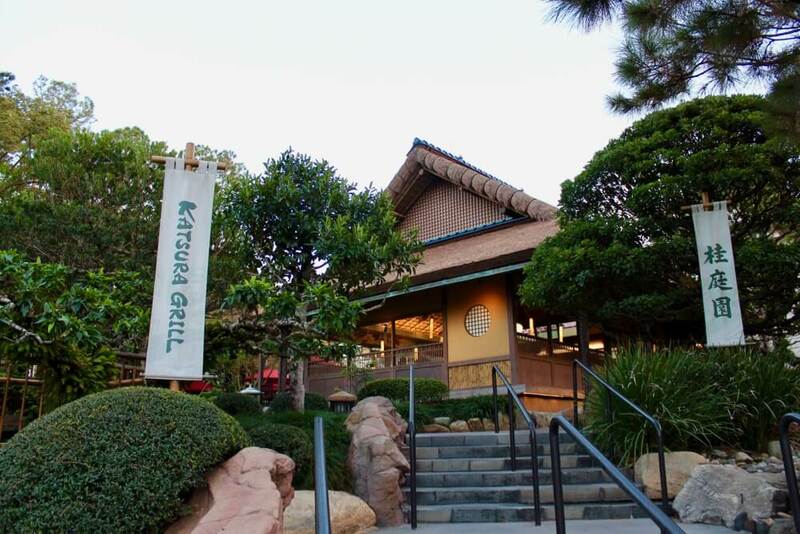 Katsura Grill sits elevated from the pavilion atop a hill. This location makes for amazing views. The restaurant's interior features a long table for communal dining and modern Japanese artwork. This is your quick spot for sushi, noodles, chicken cutlet curry and sake. The children's selection is teriyaki chicken, beef, or chicken and shrimp with veggies, rice, a cookie and a drink. With your dining choices in hand, head outdoors and grab a table. You'll be rewarded with a serene spot that allows a glimpse into the lagoon. Sit down, find your zen and enjoy. 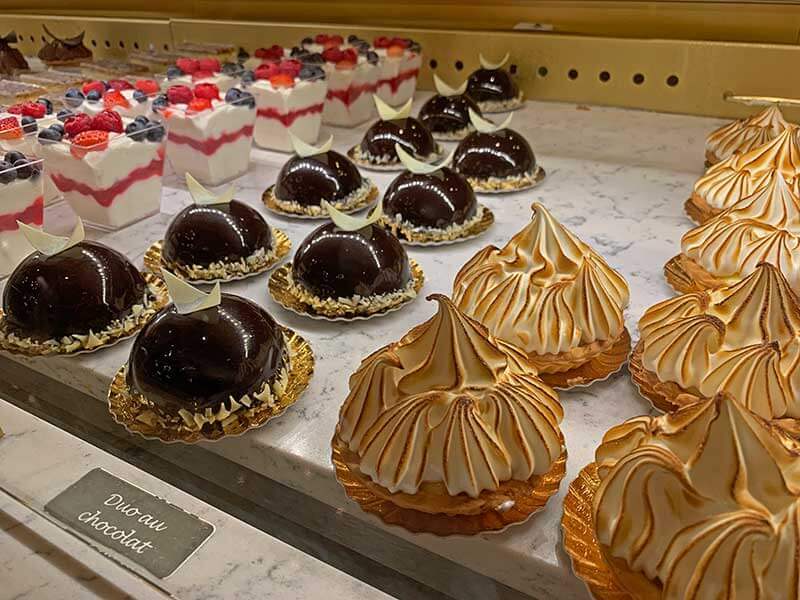 This traditional French bakery has a variety of delectable offerings, from macarons to pain au chocolat to eclairs. Lily absolutely loves to practice her French (just like Belle) and choose a treat from the seemingly endless case (it's a tough decision). 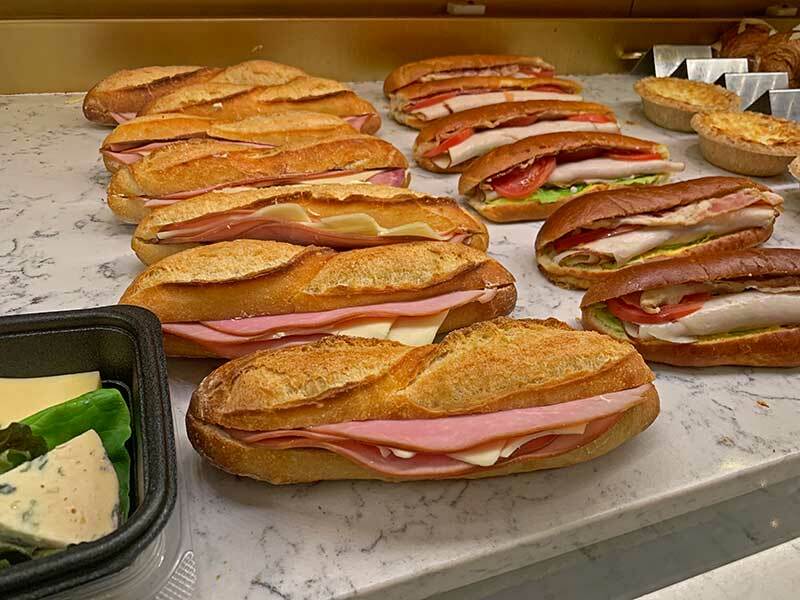 While the sweet offerings are delicious, there's also savory options such as Quiche Lorraine, Croque Monsieur, sandwiches, croissants and baguettes. This is a wonderful option for breakfast, complete with gourmet coffee options (cappuccino, anyone?). Seating inside can fill up quickly; we often like to find a spot outside to watch the fountain while we enjoy. Bon appétit! 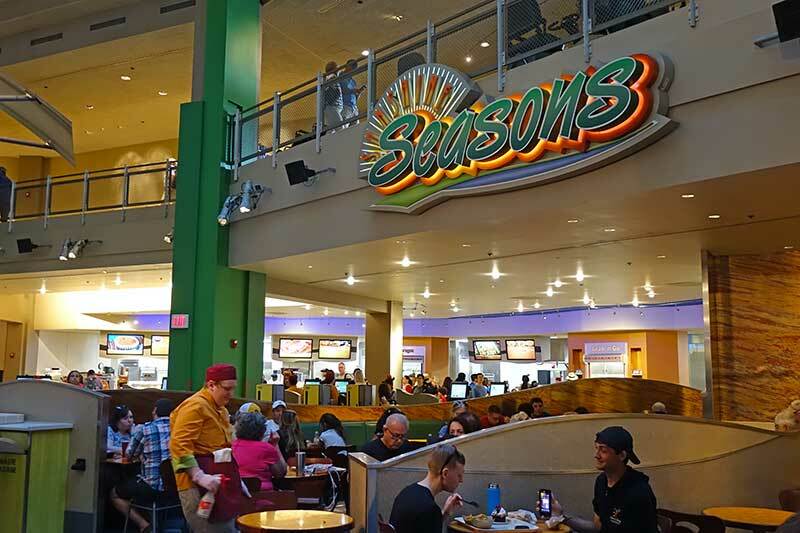 Located in Future World, in the same pavilion as Soarin' and Living with the Land, Sunshine Seasons lives up to its name with a bounty of fresh, healthy lunch or dinner options for the entire family. There are several food stations to choose from, including The Sandwich Shop & Bakery, Asian Wok Shop, Soup & Salad Shop and The Wood-Fired Grill. 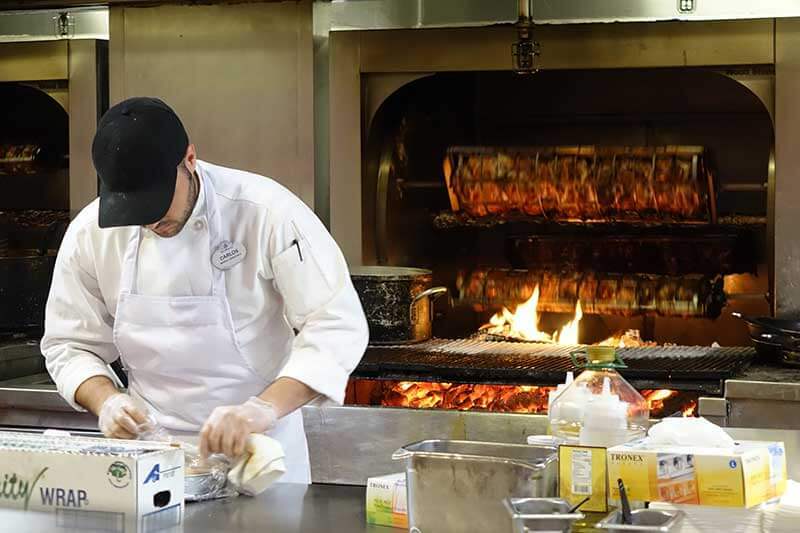 Try some juicy, oak-fired chicken from the in-house rotisserie ovens at The Grill, served with yellow rice and black beans. Looking for a vegetarian option? Visit the Asian Wok Shop for vegan korma with plant-based chicken and cashews. Kids options include salmon with green beans and jasmine rice, a chicken wrap with carrots and apple slices, a chicken drumstick with rice, and macaroni and cheese with green beans. Sunshine Seasons also offers grab-'n'-go options for the frog fam on the go. Some of the produce used at Sunshine Seasons comes directly from The Land's greenhouses, providing a hands-on, teachable moment for tadpoles. Even better, this Epcot quick service restaurant offers plenty of seating in the cool AC, making this a perfect stop to refuel, rest and learn. Is your stomach growling? Do you have an addition to add to our list of the best Epcot quick service restaurants? Let us know in the comments below! Agree, Sunshine Seasons used to be the best counter restaurant in all of Epcot. It was something we looked forward to, and it was an easy choice because it was so good. We have found that it has deteriorated badly and is no longer worth visiting. Most of our old favorites are gone, portion sizes are smaller, current choices are lackluster or tasteless, and sometimes entire food sections close down. Have you been recently? Thanks for weighing in! We visited and ate at Sunshine Seasons just a few weeks ago. Which Quick/Counter Service restaurant is your favorite? We love the orange chicken and rice in China. Huge portions - so yummy! Looks like they have revised the list and included Tangierine. Love that place. Another favorite of mine is the Fish and Chips spot in the England Pavillion. I agree though that Sunshine Seasons is the best! Thanks for weighing in! We really thought about including Fish and Chips as honorable mention because they are sooooo good! Leaving out Tangierine Cafe is borderline blasphemous. Especially since Electric Umbrella was included. I love the other 4 spots you listed, though. I so agree, it's one of my favorites. You get so much bang for your buck, especially if you're on the dining plan and the food is delicious. Thanks for reading the blog. Tangerine Cafe is a great spot too!